Finding a particularly small or slim washing machine is a tough task. If you are looking for a new washing machine with reduced height there are ways round it. But if you want one that is significantly less deep or wide you may have a problem. 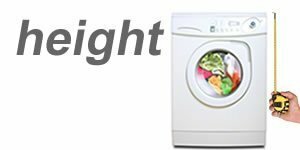 This article contains tips and advice for anyone looking at buying a new washing machine, especially if you are looking for one that is smaller than normal. Reducing the width or depth of a washing machine usually impacts drum size. There just isn’t not enough demand for such small washing machines, so there are hardly any about. Over the years I’ve seen many “slimline” washing machines produced, but then discontinued. Most washing machines are a very similar size. But they do vary by up to several millimetres. So if you don’t have a 60 x 60cm space you can get caught out. Even 1 mm too big is enough to prevent one fitting in place. So always double check the technical specifications for measurements before buying a new one unless you have more than enough space. Some extra large capacity washing machines have slightly bigger than normal dimensions. But the majority of UK front-loading washing machines are roughly 850mm height, and 595 to 600mm wide . They are designed to fit into a standard size kitchen width space of 600 mm x 600mm (60 x 60cm). 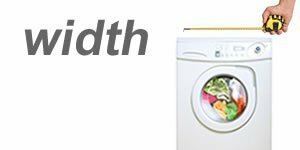 The most common size problem seems to be when the washing machine is too wide to fit in the standard 600 cm wide kitchen space. In the UK we have many small kitchens. So compromises are often made on the space. There are very few washers with much smaller widths than other brands. Top loading washing machines, or rare compact washing machines with very small drums will be significantly less wide. But they are unsuitable for most people. Plus a top loader can’t have a worktop above it. In my random check of 33 examples of washing machine sizes and dimensions 32 were between 59 and 60 cm wide. Only one was less wide at 52 cm. However, it also had an large 8Kg drum. So I’m sceptical. Mistakes sometimes happen with quoted measurements. If you find one significantly different – make sure it isn’t a mistake. Check with the manufacturer. My checks were casual. There could be other washing machines with different measurements that I didn’t come across. If desperate, you will need to search online. Washing machine height is the same on virtually all washing machines. Out of the 33 washing machines I checked only 3 were less than 85 cm high. And they were only fractionally lower. They were 84, 84.5 and 84.8 cm. If you need one to be quite a bit lower you may be able to get around it. Many manufacturers make what’s called a height reduction kit. This involves removing the lid and replacing it with a very thin flat one. This alone can reduce the height of a washing machine by 20mm or so. This is usually more than enough to let it fit under a lower than normal kitchen worktop. It also usually involves removing the feet, and fitting smaller studs. However, you shouldn’t just remove the lid yourself. There are some safety issues to bear in mind as discussed in my reducing height of washing machine article. Again, washing machines are all mostly the same depth, but there is more variation in depth than any other dimension. Ironically this is often the least critical measurement. A washing machine that's deeper than average can usually still fit in the space. It will just stick out a bit more. This might just look less than ideal for many people, but it rarely prevents one from being fitted. However, there are some potential pitfalls to having a washing machine that is to deep. Will anything catch on washing machine? Watch out for the depth of a washing machine if you have kitchen drawers, cupboard doors or even main doors opening across it. I recently installed a washing machine for my daughter and was reminded how we need to remember to take into account how modern washing machines (and matching tumble dryers) have a tendency to bulge out at the front, or have large doors that stick out quite a way. After installing the washing machine in my daughter’s kitchen my heart sank as I realised that their back door, which opens across it, was going to catch on the washing machine. Fortunately I was able to force the washer back another few millimetres and the back door cleared the washing machine – literally by a millimetre! You couldn’t pass a credit card between them at the point where both doors almost touch. 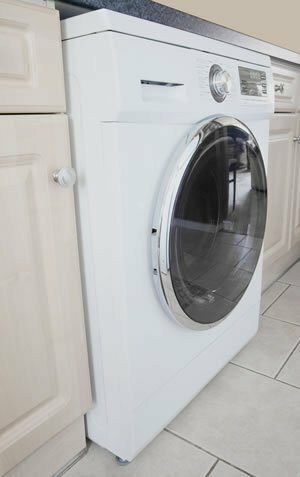 Always check out the measurements of a new appliance when replacing an old one even if you currently have an old washing machine in there as they may be small but critical differences and modern washing machines are often wider and deeper than ever. Dimensions are usually available in the “specs”, product info, or “specifications” section describing the appliance being sold, either in the brochure or on a web page. 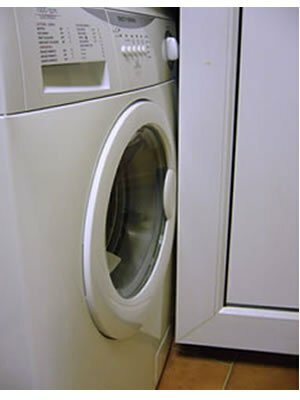 The depth of a washing machine quoted by the manufacturer should in theory take into account the whole depth, but does it include the way the front may bulge out as well as the door? If critical, double check. can you please help I am at my wits end need washing machine with height no more than 82cm,would you know of retailer in my area . All the help I have is put into this article. Have you tried the links on the right column where you can search for washing machines by width and height? Also, you can look into the height reduction kits many manufacturers have which I mention in the article. I have an Indesit WIL123 washer which is 83cm high under an 85cm high worktop. I wish to replace it but most machines are 85cm high. I have a vague recollection that the feet were removed to get under the worktop. Does this sound feasible and could this be done with a replacement? Yes removing the feet can reduce the height although only by a small amount. The best way to reduce height is to replace the lid with a flatter one. The feet are there for stability and to prevent damage to the floor so you’d need to judge whether that was ok or not. Some manufacturer’s height reduction kits did involve removing the feet but replacing them with thinner studs. If you removed the feet and the machine was placed on a carpet this could block any air vents (if fitted in the base) or if the base is open would block air getting underneath and could be a very bad idea. The space for our washing machine is in the corner of the kitchen and has a cupboard door, which opens in front of it. The kitchen fitters made the space almost perfectly for the machine that we had. Now our machine is dead and I’m having loads of trouble trying to replace it. The space is slightly less than the standard 600mm (only by 2 or 3 mm) and the depth must be less than 590mm. Our dead machine is an Indesit IWDC 6143 (595mm wide x 535mm deep). I would rather not buy another Indesit as we’ve had loads of problems with them but I cannot find anything else that fits. any suggestions? The only thing you can do is trawl through all the washing machines specs. Sadly you can’t always trust the specs 100% though, I’ve seen errors before although if you bought one and it was different to the measurements advertised you would at least be entitled to return it. Hi. I want fit a washer under worktop in the corner of kitchen. but it will stop me acessing the drawer from above. Any alternatives to the standard drawer? You could get by using detergent designed to go inside the drum, especially if it also contains fabric softener. 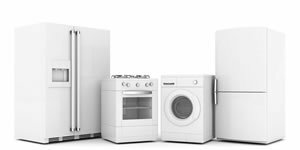 Try searching using my “Compare white goods by size, colour, spin speed, drum size and many other filters” links in my article above Robert. I need a second opinion please! I’m looking for a new washer and the one I have my eye on is 645mm deep (according to the Coop) or 615mm deep(according to Currys!) I have a space 730mm deep, measuring from back wall to edge, but includes the waste pipe work running across the bottom of the wall. Do you think this will fit in ok? It is right behind the back door, which has to be able to open fully to accommodate a wheelchair. Your thoughts would be appreciated, my head is spinning! thank you. Hello Mrs M. That’s why I advise in my article that we can’t trust the specs given on web sites. I’ve seen lots of mistakes. The depth of a standard worktop should be 600 mm and washing machines don’t usually stick out too much over that but things like plumbing can stop them pushing back flush against the wall, and bulging doors or control panels and knobs can also add to the problem as shown in one of my photos. Manufacturers usually design so they don’t stick out too much over 600 mm worktop even with plumbing behind the machine which is extremely common. However, they can stick out a few inches or so but it does sound like you have plenty of depth if you get 730 mm. If it’s the longer measurement of 645 it still sounds like there’s room for plumbing. Ultimately if you order online you can send it back within 14 days with no reason needed as long as you haven’t used it. Thanks so much for your opinion, it is very helpful and much appreciated! Smaller machines with big loads seem to be quite noisy according to the reviews I have read has anyone had any success in finding a decent machine with.out Compromising on the load size? Hello Jaz. You may have to look at built-in appliances. As far as I know all freestanding washing machines are roughly the same height. There’s nothing in it for the manufacturer to make a washing machine smaller than the standard kitchen unit size. They have to cram enough in as it is without making them smaller, especially now they have much larger drum capacities. As 99% of washing machines are 60cm width plus…… help please I am struggling to find one ? That’s the problem Jesse. These days with all the extra large drum capacities they can’t afford to cut the size down or they just can’t fit parts in. There are no machines with reduced width other than potentially a few millimetres other than compact machines (which are very rare and only have very small drums) or top loading washing machines. No Peter, not that I know of. Width is the one measurement that is fairly consistent. If they reduced the width to 500 mm they just wouldn’t be able to fit the parts inside it. 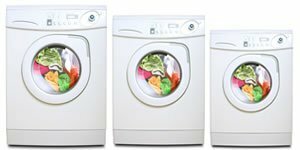 The only washing machines that are significantly thinner than normal that I’ve ever seen are top loaders, or compact washing machines which are a very small niche market with very small drum capacities such as just 3 or 4Kg (the average is now 6 or 7Kg). Most of the compact washing machines don’t last long before becoming obsolete because they just isn’t enough demand. A washing machine 50 cm wide does exist, but maybe you can not get it in the UK. It is an Electrolux machine, maybe only sold on the continent. It used to be made in Sweden. Bosh used to do one in the UK and I used to link to it but it went obsolete so I had to remove my link. I think it was 4Kg drum. Any washing machine that slim is likely to be useless to a family though as the drum would be far too small. 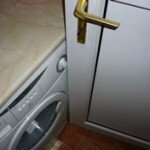 How can you easily manouevre a washing machine into a tight space? You say the standard gap in a kitchen is 60cm, but as my washing machine is 59.5cm that is only half a cm wiggle room. Is this reasonable to allow so little gap round the sides? Are there contraptions to help get the machines in and out easily? 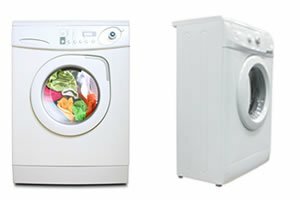 Hello Ruby, I have advice on moving a washer on my best way to pull a washing machine out article under the heading, “Tips for pushing a washing machine back in place”.